Hype is cool, but real substance is even better. 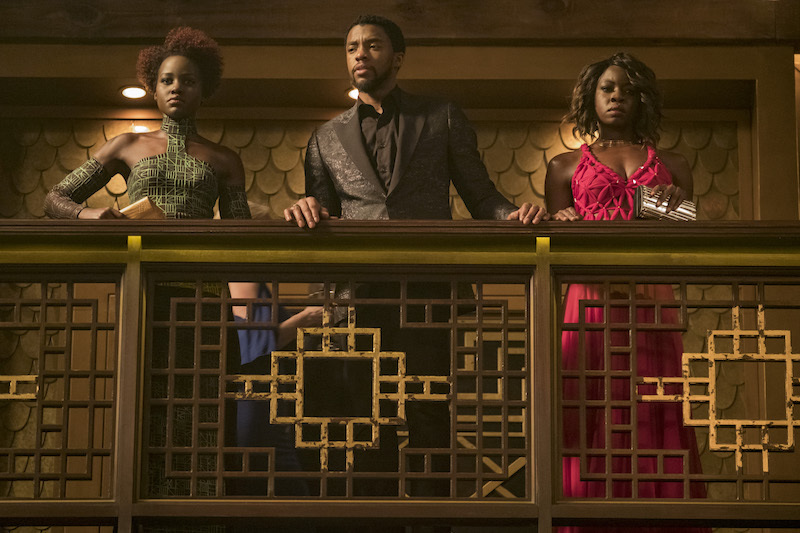 The Black Panther movie opened to amazing reviews and fan reactions — and let’s not forget the record-breaking box office stats, with the movie making $192 million over the three day weekend. And this isn’t just groundbreaking for the Marvel universe. Black Panther‘s success speaks volumes about the bankability of a mostly Black cast and a Black director. While watching the movie this weekend, I couldn’t help but focus on one thing: The hair. Tons of natural hair. 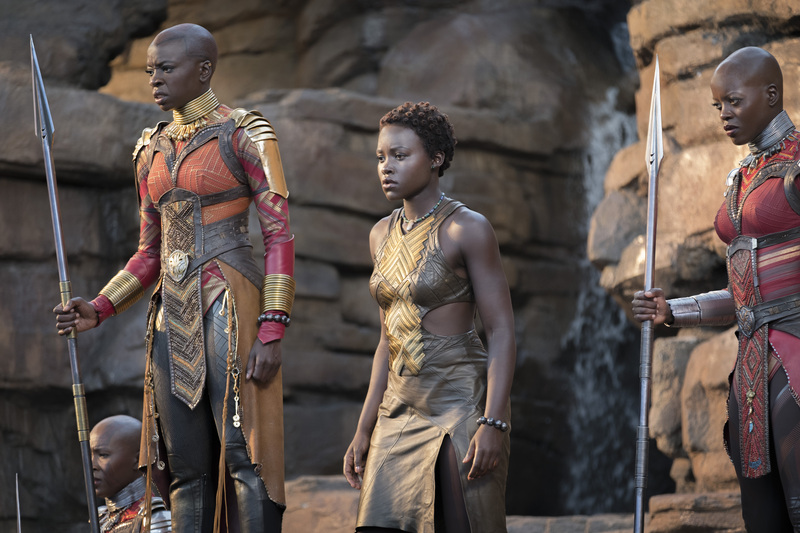 I didn’t just stare in amazement at the intricate costumes or Michael B. Jordan’s upper body; I was also stunned by the representation of natural hair. And like any aspect of a great movie, everything is intentional — from the costuming to the dialogue to the hair. The head of hair department on the Black Panther set, Camille Friend, told The Cut she specifically requested that everyone come to set with natural hair. 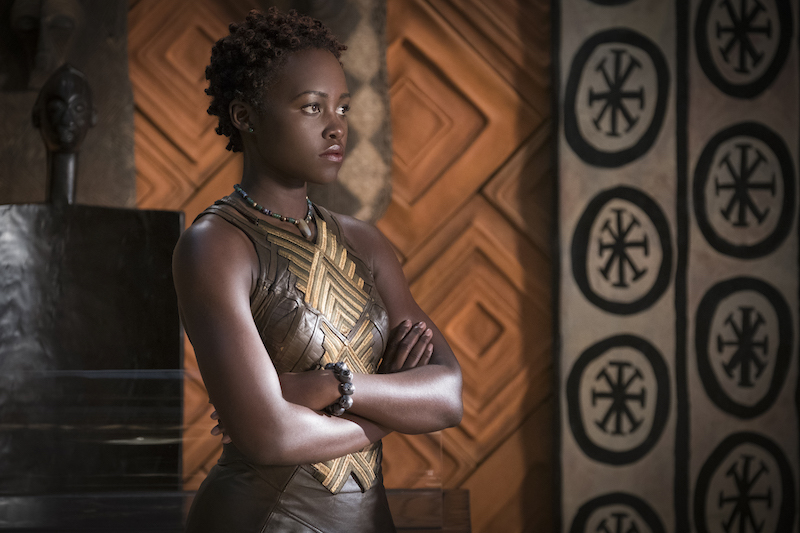 All of the women, from Princess Shuri to Nakia to the warriors of the Dora Milaje, were rocking natural hair. They weren’t the hippie-dippie sidekick or a comical Afrocentric caricature. These women were fierce, multi-dimensional characters. I remember wondering: If I had seen all of this beautiful natural hair in a blockbuster movie years ago, would my own natural hair journey have been easier? More accepted? No one in my family has natural hair, and I only made the decision to go natural 10 years ago. Up until that point, I’d used chemical relaxers that straightened my hair every six weeks. For at least a year after making the change, my mother would ask me, “Are you going to keep your hair like that?” I knew she meant no harm; this hairstyle was just different for her. Most of the images I saw on film and television of women with curls, kinks, and coils were that of the hippie, direction-less woman or the dark-skinned girl who was never the love interest. Of course, I adored Rudy’s voluminous natural hair on The Cosby Show and I tried to emulate every braided style Brandy had on Moesha. But I rarely saw adult women who didn’t have relaxed hair on-screen. So watching the women of Black Panther just felt so damn good. They were smart and desirable. 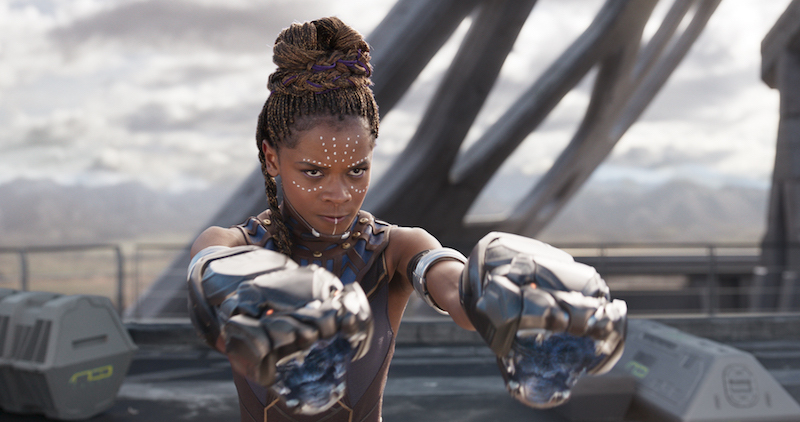 Fan favorite Princess Shuri (Letitia Wright) is said to be the smartest person in the world and a tech wiz. Besides stealing the movie (her one-liners were perfect! ), she also rocked beautiful braids in chic updos. 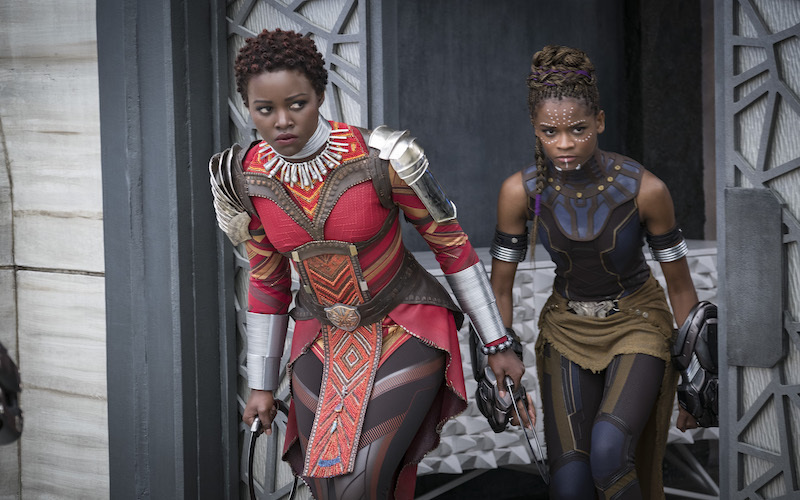 And can we talk about the Dora Milaje? 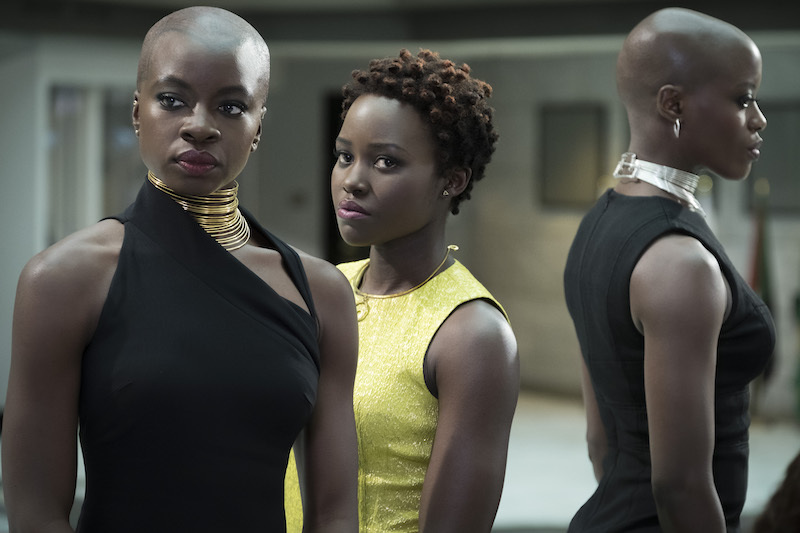 Their signature bald heads are sources of strength and status for the all-female security team that guards T’Challa. The head of the Dora, Okoye (Danai Gurira), is a multi-layered character. She’s not a robotic, speechless warrior who just fights. She’s a friend and protector of the King, loyal to her country and lover to W’Kabi. The only overt reference to hair in the film is during the epic casino fight scene. In order to go undercover, both Nakia and Okoye have to change their hair — this is their form of assimilation. 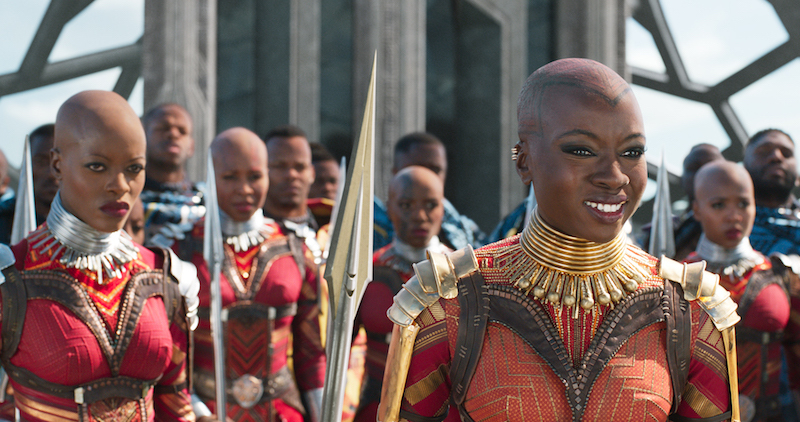 Nakia rocks a beautiful twist out, and since a bald woman stands out too much, Okoye dons a wig that she’s clearly uncomfortable wearing, even referring to it as a “disgrace.” When the trio is discovered by the bad guys, Okoye immediately flings off her wig and uses it as a weapon to distract her attacker. In addition to being in awe of their bomb characters, I was getting serious style inspo. If I want to braid my hair, maybe I’ll do a fun undercut like Shuri. Or a cute bantu knot style would be perfect for spring. And hey, if I decide to chop my hair off again, I can totally rock a baldie with pride. I don’t think Black hair has ever been seen like this in a blockbuster movie — at least not by me. This kind of hair inspo wasn’t there for me a decade ago. Most of the natural hair YouTubers I love now weren’t around yet either, so I was pretty much winging it by myself. When girls and women see the characters in Black Panther, I’m sure they’ll feel that their natural hair options are limitless. You can be fly and natural and not a punchline.